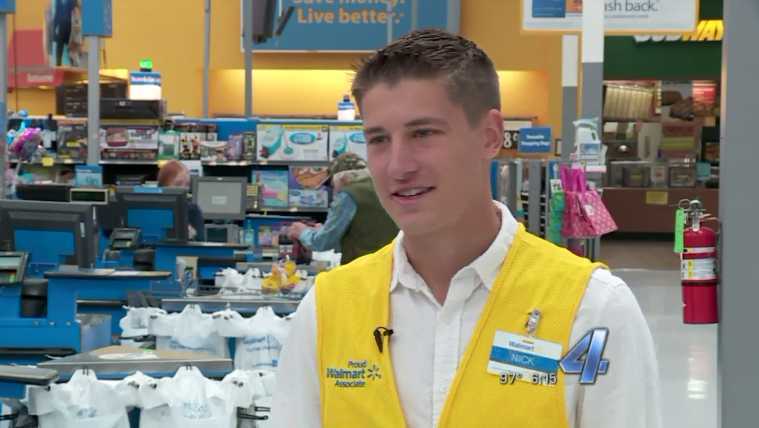 NEWCASTLE, Okla. — A Walmart cashier is crediting the leading of the Lord after he paid for a foster mother’s groceries when some items wouldn’t go through on her new WIC card. Nicholas Tate, 22, a student at Austin Bible Institute, was working at the Newcastle Walmart recently when a woman came through his line with three children. The frazzled woman explained that she is a foster parent to a baby, and that she had just signed up for WIC, which helps to pay for formula and other baby items. She apologized as she had never used the card before. As she had inadvertently purchased the wrong formula, it wouldn’t go through, and the line began backing up. Tate called for help from a manager. In the midst of the situation, Tate felt like God was nudging him to pay for the woman’s needs himself. “We tried to run it again, and the WIC still didn’t work. So, I just felt like God was telling me just to pay for it,” he said. Tate pulled out his own credit card and swiped it, paying for the remaining $60 in product that wouldn’t go through. It was approximately a day’s worth of wages for Tate. “What are you doing?” the woman asked. “[I]nstantly, she started bawling her eyes out,” Tate remembered. He encouraged the woman that she wasn’t a failure as she had stated to the disgruntled customer. “[H]e told me that I wasn’t failing and that what we were doing was an amazing thing,” she wrote on social media. The woman says that she posted the status in realizing that she had been so overcome with emotion that she did not get a chance to thank Tate, and hoped she could connect with him. A few days later, one customer showed Tate the post and inquired if he was the young man that she had written about. He said yes. The two have since been able to speak to each other, and Walmart and WIC even reached out to the woman to offer to make it up to her for her trouble. Tate has remained humble as his story has spread nationwide. He says he was only being obedient to God and encourages others to do the same.